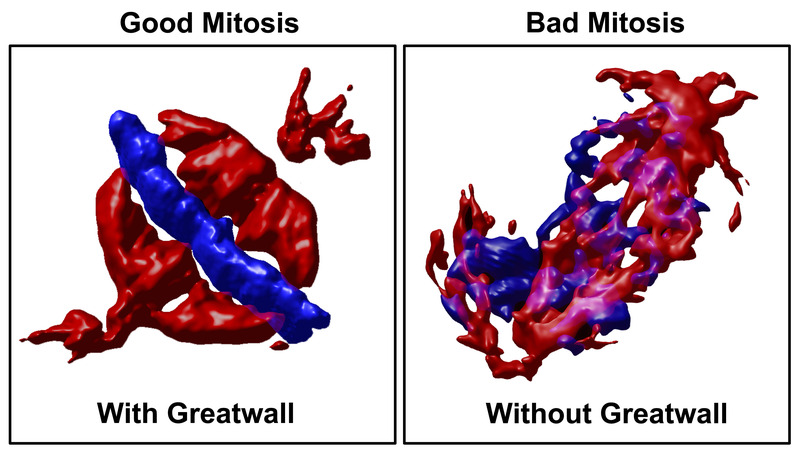 Our favourite protein in the lab is Greatwall kinase. It was first discovered in 2004 to be critical for cell division in fruit flies (1,2) . The trail then went cold for a few years as to its exact function, but in 2009, while I was working as a post-doc in France, I was fortunate enough to be in the lab that uncovered its exciting mode of action. For cells to get into mitosis they must activate a key protein called cyclin dependent kinase 1 (Cdk1). I like to think of this as the accelerator in a car. So to get moving cells push on the gas! And conversely to get out of mitosis you need to hit the brakes. These brakes are the phosphatases which reverse the action of kinases like Cdk1. That’s great but what is missing from this equation? Well like any car it’s pretty useless without a driver to co-ordinate the accelerator and brakes. And this is where Greatwall (Gwl for short) comes in. It makes sure that when Cdk1 (accelerator) turns on that the breaks get turned off and vice versa (3,4). Without Gwl the cell gets into a lot of trouble very fast, which you can see in the image below. Here I depleted the human version of Gwl (a gene called MASTL) and watched what happened as cells tried to undergo mitosis (5). As you can see they don’t do a very good job… the result is cells fail to divide correctly, resulting in multiple defects and often cell death. I hope you enjoyed part one of my feature on Gwl, and in part 2 I will into more details about this amazing and exciting new protein. 1. Bettencourt-Dias, M. et al. Genome-wide survey of protein kinases required for cell cycle progression. Nature 432, 980–987 (2004). This entry was posted in Images and Videos, Info, News and tagged anaphase, apoptosis, Cancer, Cdk1, Cell cycle, cell division, Checkpoint, chromosome bridge, Confocal, Greatwall, Gwl, kinase, Leica, live cell imaging, metaphase, microscopy, Mitosis, phosphatase, prophase, Science, SP8, Zeiss. Icy: More Excellent free Microscopy software ! New Garvan Website is now Live !